This photo of Pluto (right) and its largest moon Charon is the best visible-light photo of the dwarf planet ever taken from Earth. It was taken by the North telescope at the Gemini Observatory using the speckle imaging technique for better clarity. Image released Sept. 26, 2012. A ground-based telescope has snapped the sharpest image yet of Pluto and its moon Charon taken in visible light from Earth. 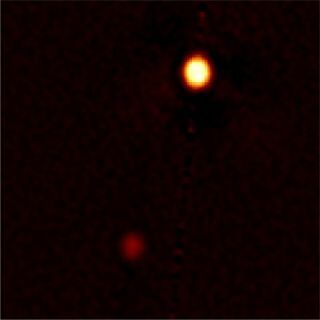 The Gemini North 8-meter telescope on Mauna Kea, Hawai'i captured the photo of the dwarf planet and its companion using a technique called reconstructive speckle imaging. The resulting image clearly shows the two bodies, which are nearly 3.7 billion miles (6 billion kilometers) from the sun — about 40 times the distance between the sun and Earth. The success of the photo, which Gemini officials unveiled today (Sept. 26), suggests the method could be useful for imaging planets beyond our solar system as well, scientists say. NASA's planet hunting spacecraft Kepler surveys a vast swath of stars looking for dips in their brightness caused by planets passing in front of them. To confirm these planets, scientists rely on ground-based observatories. Reconstructive speckle imaging, which combines multiple snapshots of the same object to achieve sharper images, could be used to enhance Earth-bound telescopes' ability to spot Earth-like planets around other stars initially discovered by Kepler. "This is an enormous gain in the effort underway to confirm small Earth-size planets," study leader Steve Howell of the NASA Ames Research Center in California said in a statement. "The Pluto-Charon result is of timely interest to those of us wanting to understand the orbital dynamics of this pair for the 2015 encounter by NASA's New Horizons spacecraft," Howell said. The resulting resolution is good enough to see a pair of car headlights in Providence, Rhode Island, all the way from San Francisco. The photo was taken using a special camera temporarily attached to the Gemini scope called the Differential Speckle Survey Instrument (DSSI). "This was a fantastic opportunity to bring DSSI to Gemini North this past July," said research team member Elliott Horch of Southern Connecticut State University. "In just a little over half an hour of Pluto observations, collecting light with the large Gemini mirror, we obtained the best resolution ever with the DSSI instrument –– it was stunning!"